Easily move all games in Oculus installation directory to another drive to release disk space for other usage, solving low disk space problem. Oculus Mover aims at moving Oculus Rift games and applications from its original drive (usually system C Disk) to another drive with much free space. Thus, a lot of disk space will be spared out in source drive for other usage, maybe for saving future Oculus Rift VR games or Oculus Rift upcoming games. Apart from migrating games for Oculus Rift, Oculus Game Mover can also move other items out of original storage space, such as Oculus Rift videos, apps, pictures, music, etc, as long as these items were stored in ”Software” or ”Download” folder in Oculus. 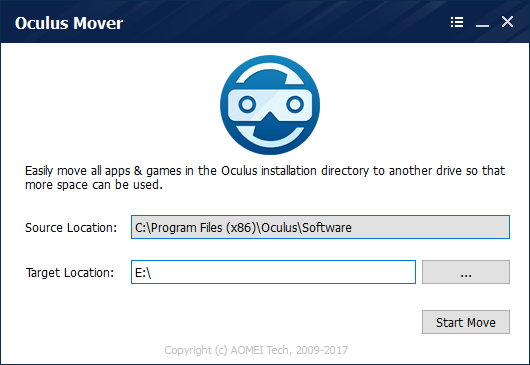 Oculus Mover ensures Oculus’ normal work once you move Oculus installation directory to another drive. The traditional way to move Oculus to another drive is to do it with mklink. In this way, however, we have to open “Command Promote (Admin)” and type in mklink commands. This might not be difficult for IT guys, but it is obvious too complicated for common users. But with Oculus Mover, you can simply select the source and target location from a windows type interface to migrate Oculus from one drive to another. How Does Oculus Mover Works? 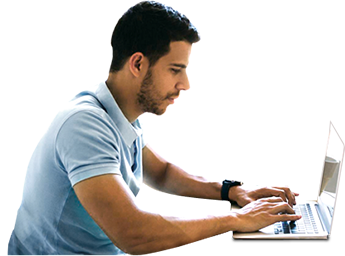 Before moving virtual reality PC games or applications, you should firstly get and install Oculus Mover on your PC. If the destination is an external device, please insert it into your computer. We suggest you to migrate VR supported games to local instead of external/removable drive. If you do have to do so, then make sure the external/removable disk is connected to your PC every time when you use Oculus. In its main interface, the source location is automatically detected and is listed in game directory column. Step2. Specify the target location. Select a location that you want to save the moved Oculus Rift games or applications. If everything you set is alright, please press "Start Move" to start migration. Tip:The target location won’t be overwritten so please feel free to move Oculus Rift games to the destination. With the help of Oculus Mover, you can easily move Oculus games or applications from one drive to another, instead of typing in mklink commands. Tips: we suggest you to download Oculus Mover, because vrBackupper (another free Oculus Rift backup, restore and migration tool) only supports Windows 10 64bit only. 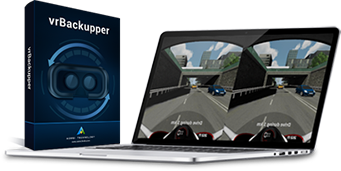 However, if Oculus Mover doesn’t meet your requirement, you can download vrBackupper instead.